Q: What made you decide to focus on the age when infants die in this new analysis of infant mortality in the United States? DE: We focused this study on the age when infants die for a number for reasons. Age at death is an important factor in the risk of infant mortality. One important statistic is that infants are more likely to die before 28 days of age (neonatal deaths) than infants who live to 28 days and older (postneonatal deaths.) By presenting infant mortality rates by age at death, we show the differences in the likelihood of death between these two infant groups — information that can help inform the U.S. Public Health Community, families, and physicians on this critical age factor in infant lives and deaths. Q: What sort of trend data do you have for the demographics and the cause of death data in your new study on infant mortality at the age of death? DE: We have interesting trend data here in this report, as well as other public-use resources that are available for further research and data. Our new report looks at the overall trends in infant, neonatal and postneonatal mortality rates from 2007 (the most recent peak in infant mortality) through 2016. For 2016, we looked at infant mortality rates by mother’s race and Hispanic origin and age and cause of death. Q: Was there a result in your study’s analysis of infant mortality at the age of death that you hadn’t expected and that really surprised you? DE: An important finding in this study is the lack of improvements to infant mortality. Since infant mortality had been on the decline in the United States for much of the last two decades, it was surprising that the infant mortality rate did not show significant declines from 2011-2016. Another recent report also showed a similar lack of improvement in fetal/perinatal mortality rates from 2014 through 2016. Q: What differences, if any, did you see in infant mortality among race and ethnic groups, or any other demographics? DE: The sometimes substantial differences among race and Hispanic origin groups in this report on infant mortality are noteworthy. We found that infants of non-Hispanic black mothers continue to have total, neonatal, and postneonatal mortality rates that were more than two times as high as infants of non-Hispanic white, Asian or Pacific Islander, or Hispanic mothers. Infants of American Indian or Alaska Native mothers had the next highest rates and had postneonatal mortality rates that were similar to infants of non-Hispanic black mothers. DE: The most important message from this data brief is the lack of improvement in total infant mortality rates since 2011. Neonatal infants of all race and Hispanic origin groups we examined have higher mortality rates than postneonatal infants. Further, infants of non-Hispanic black women continue to have a higher risk of mortality than infants of non-Hispanic white, Asian or Pacific Islander, American Indian or Alaska Native, or Hispanic mothers. This information can further our understanding of current infant mortality trends and provide information on where improvements can be made. Q: What findings in your new data analyses on births and infant mortality most surprised you and why? LR: These latest quarterly provisional estimates suggest that the steady decline in teen birth rates that we have seen over the past several years is continuing into 2017, which is good news. What is of concern is the recent uptick in preterm birth rates, a trend that emerged in 2015 and that has unfortunately continued into 2016 and early 2017. Q: What is the difference between the Rapid Release provisional estimates on births released today and the report from your office released last month, “Births: Provisional Data for 2016”? And how are these two provisional data analyses different from your office’s “preliminary data” released in the recent past? LR: The most recent Quarterly Provisional Estimates provide an update to some of the data released in the recent report, Births: Provisional Data for 2016. That report is similar to previous “preliminary birth data” reports, but is redesigned and released under our Vital Statistics Rapid Release (VSRR) program. We hope that the VSRR program can be a one-stop-shop for our provisional vital statistics data. The Quarterly Provisional Estimates describe very recent trends in key indicators of maternal and infant health from the birth and mortality data the report, Births: Provisional Data for 2016, provides some critical context for understanding these recent trends. report also describes some additional demographic and reproductive health indicators that aren’t yet available in the Quarterly Provisional Estimates, such as birth rates by race and Hispanic origin, as well as the timing of prenatal care. Q: What in your data analyses can be attributed to no change in infant mortality in the last few quarters? LR: is another surprising and concerning finding, because infant mortality rates have generally been declining over the past decade, at least through 2014. These declines seem to have leveled off more recently, according to our provisional estimates. We can’t speak to why infant mortality rates might no longer be declining, but we are planning future research to help us better understand this troubling trend. Q: What differences did you see among various age groups of mothers? 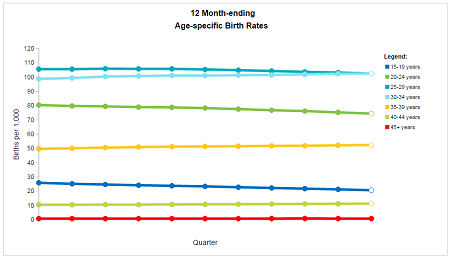 LR: There is a great deal of detail in the recent report, Births: Provisional Data for 2016, discussing how age-specific birth rates have changed recently. Generally, both that report and our recent Quarterly Provisional Estimates show that maternal age is increasing. Birth rates among younger women (under 30) are going down, while those among women 35 and up are increasing. Q: What are seasonal fluctuations in the number of infant deaths and births, and what do you mean by accounting for seasonality as you described in your report’s preface? LR: People may not think that there are seasonal patterns to births, but it turns out that there are more babies born in the third quarter of the year, from July-September, than during other parts of the year. There are seasonal patterns in other indicators as well. For example, preterm birth rates dip slightly in the third quarter compared with other quarters, while infant mortality rates tend to be a bit higher in the beginning of the year than toward the end of the year. So to ensure that any differences we find aren’t influenced by seasonal fluctuations, we only compare the most recent quarter with the same quarter from the previous year. We also present 12 month-ending estimates, which include all seasons of the year, and thus aren’t subject to seasonal ups and downs. You are currently browsing the archives for the infant mortality category.